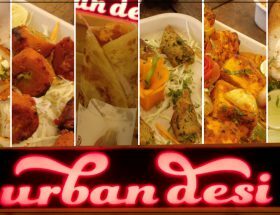 Kebabsville is one of the popular fine dining places in Indore. It is situated in Scheme No. 54, Vijay Nagar and is a part of the Sayaji Hotels, Indore. It is one of those high-end dining restaurants where you can enjoy your dinner poolside with its mesmerising ambience. It usually has a rush during weekends and you might have to wait if you haven’t done your bookings already! So, since it was a Punjabi Food Festival, I was really expecting the entire menu to be filled with Punjabi dishes only, but then there were other varieties available too, other than just the Punjabi ones. This was both a turn-off and turn-on at the same time. A turn-off because it had to have the Punjabi food only, but I was quite delighted, as we were able to have the best of both the worlds! We started our supper with a wide range of Starters they had. All of the Starters were fine but I really liked the Paneer Tikka and Crispy Corn. Paneer Tikka was all about Marinated flavours; in addition to it, Kebabsville has this very cool facility of heating the Kebabs and Tikkas live (a Barbeque sort of). Therefore, it was supremely amazing to have hot Paneer Tikka paired with spicy-yet-tangy Mint Pudina Chutney. Crispy Corn was very simple-yet-delighting, as it was tossed in Salt & Pepper. It had mild flavours that made me like it more. Then, it was show time, the time to have the Main course! 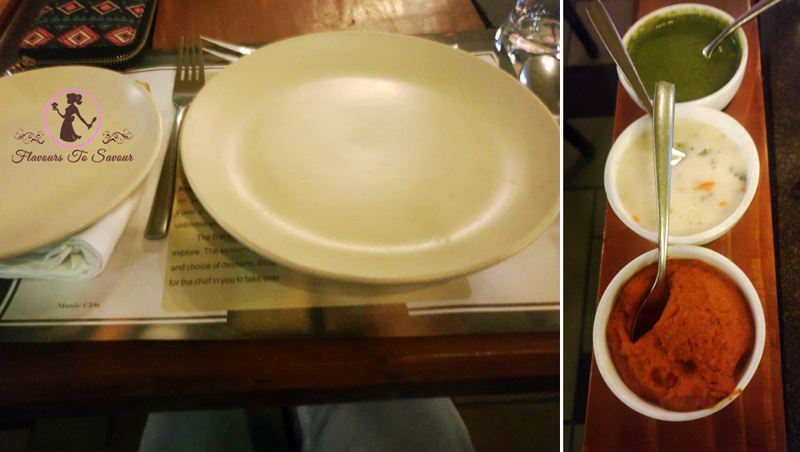 Firstly, we went for their Punjabi Special Menu and eventually tried Amritsari Kulcha & Chole Masala. Trust me guys it was one hell of a thing. The Kulcha was roasted well inside a Tandoor and then crushed well and dipped in loads of Butter. The Chole were sooo yummylicious as they were perfectly simmered with loads of Spices and topped with raw sliced of Onions and fresh Coriander. 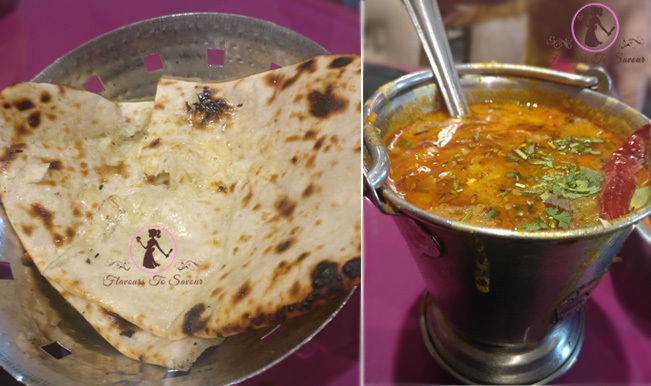 Apart from this, we also tried other dishes from the Main Course; here, I would recommend you to try the Paneer Bhurji, Dal Tadka, Dal Makhani and the variety of Bread on offer, of course. I would also like to put a special mention to an array of Ice Cream available at this place. It is one-of-its-kind and you won’t find such Ice creams anywhere in the city; a must-try I must admit! 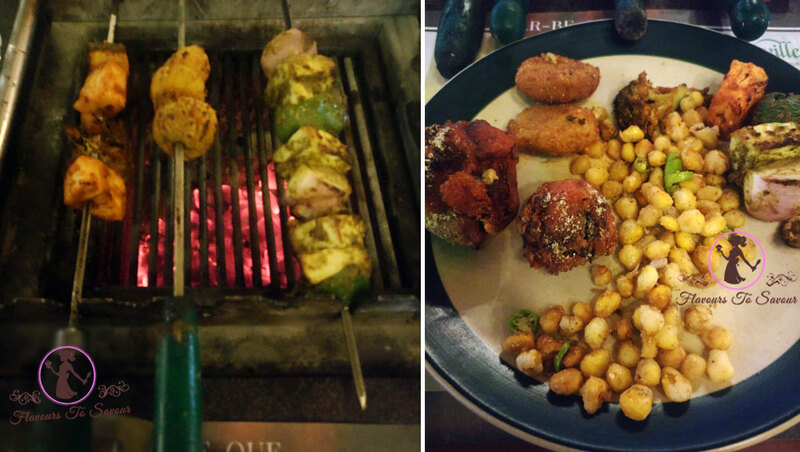 Kebabsville is one of the expensive dining places in Indore and it costs you approximately Rs. 1,000 per person, including all taxes (for Veg Meals); and approximately Rs. 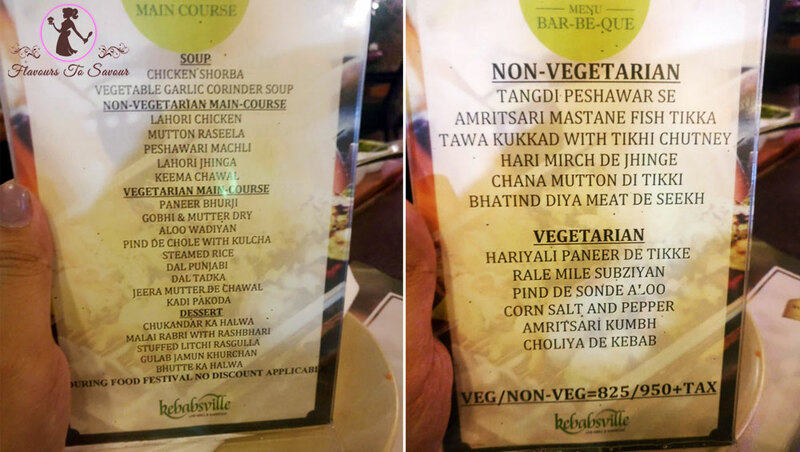 1,100 per person including all taxes (for Non-Veg Meals). 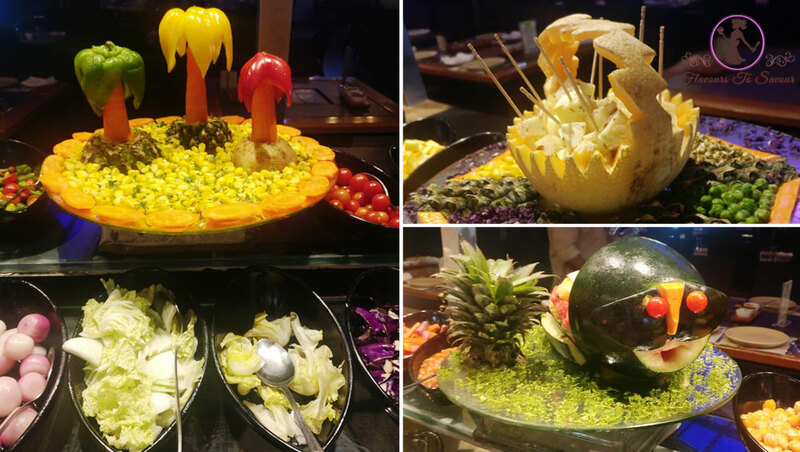 It offers you a buffet dining. One can avail corporate discounts or membership discounts usually, but during such Food Festivals, one cannot avail to such discounts. The ambience at Kebabsville is simply mesmerising. This is a dim-lit place with a poolside ambience. Also, it is not covered completely; therefore, it is surrounded by nature and the cool air in the surroundings just breathes a fresh life in the atmosphere! 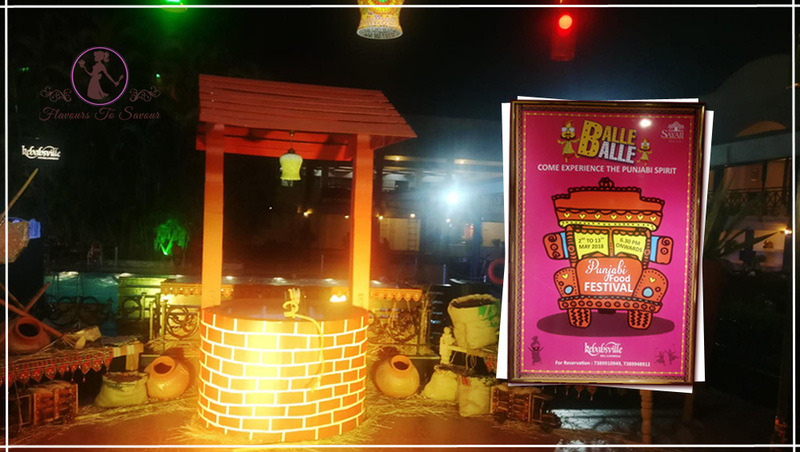 During the course of our meals, we were also a spectacle to ‘Punjabi Folk Dances’, being performed around the dining area, given the fact that it was the Punjabi Food Festival. Also, not to forget the dress code of the waiters; they were all dressed up in Punjabi outfits gave us the feel of Punjab! Service, here, is commendable. The waiters and the management are really attentive towards the guests and are present around all the time. I really liked the hospitality shown at Kebabsville. 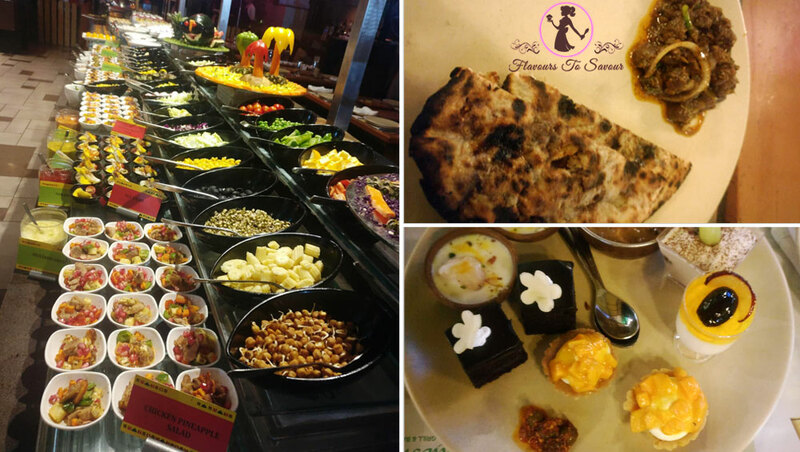 Overall, you should definitely give this place a try and especially when such food festivals are going on so that one can get to taste different cuisines and their specialities. One can visit this place if they want a rich experience of fine dining and do not mind bearing heavy costs on their pockets once in a while. Don’t forget to Like, Comment and Share this post with your loved ones. Do share your feedback below! Previous ArticleMothers’ Day Special: Coffee Walnut Pudding Recipe – You Simply Cannot Miss Out on This Savoury Dessert! 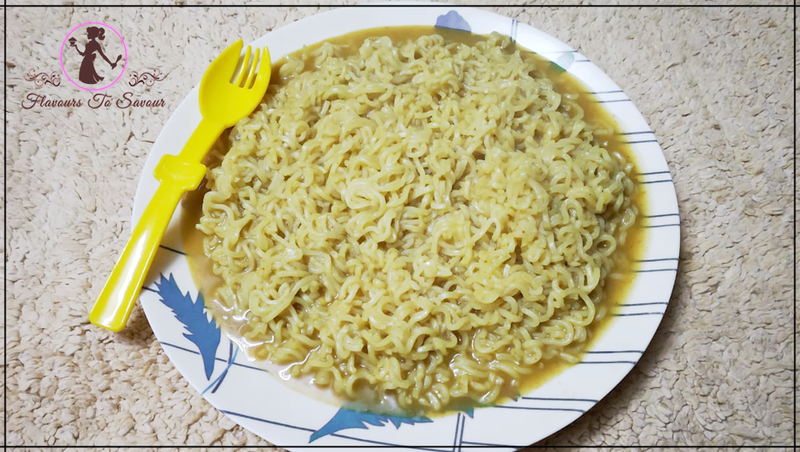 Next ArticleHow To Boil Pasta? Learn Easy Steps To Prepare Pasta Dishes Perfectly! 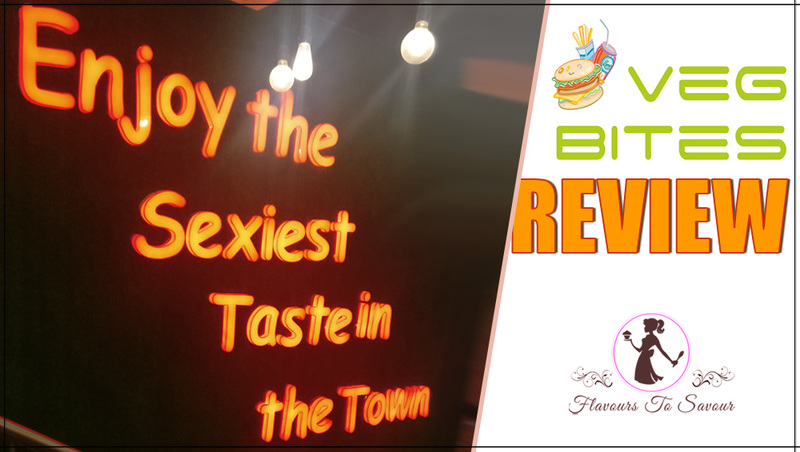 Veg Bites Review: Know More About The Food, Price, and Service of This Newly-Opened Popular Restaurant Here!